Have you ever witnessed a technique that was touted as effective that you either felt to be unsuitable or could never work under almost any conditions? Jump kick. Legend has it that the jump kick was devised by the Hwarang warriors of feudal Korea. The idea was that it enabled one to dismount a soldier from his horse with this airborne leg assault. Also, the tobi geri makes its appearance in numerous karate kata. They look great in demos and in the movies, but jump kicks are definitely not recommended for the street. Spear hand. The nukite is a vertical hand technique utilizing the fingertips. Okinawan karateka would spend years hitting the makiwara (striking post, usually made of wicker) which eventually made the fingertips calloused and flat. Nice, but it might make typing blog posts on a keypad a bit of a chore. Lunge punch. This is punching that corresponds with the same side stepping foot accentuated with a long stance. Sometimes called a "chasing" punch. 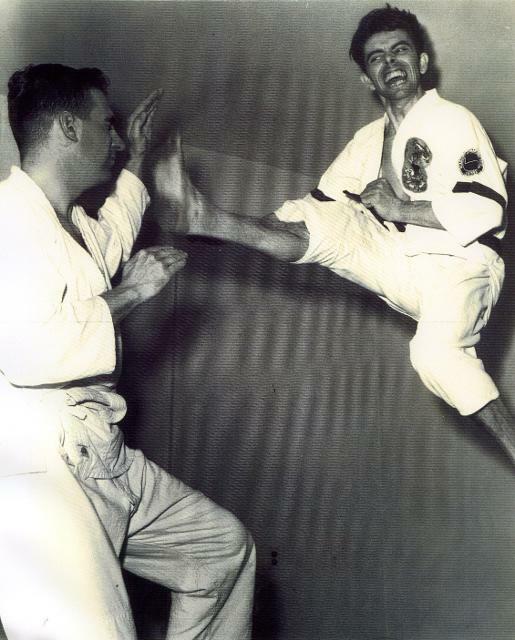 Lots of instructors like to demonstrate a self-defense technique against a lunge punch (or a knife in lieu of a punch); the lunging posture puts uke in a compromising position conducive to an easy counter. For this reason, no fighter worth his salt punches or cuts using a lunging stance. A number of inapplicable techniques continue to be taught because they're "part of the syllabus" that have been handed down through antiquity. Maybe it's time to remove some impractical filler. Modernity engenders the evolution of martial arts.